Description: This perennial wetland plant is unbranched and 4-8' tall. The central culm is more or less erect and usually curved slightly to one side. This culm is dull green, terete, and soft from a spongy interior; it is up to 1/3" (8 mm.) across at the base, becoming more slender upward. At the base, there are several membranous leaf sheaths that wrap around the culm; these sheaths lack leaf blades, or if such blades are present, then they are quite small and insignificant. Each fertile culm terminates in a single inflorescence spanning up to 6" long and 6" across. This inflorescence consists of a compound umbel or panicle of spikelets and a single basal bract about ½–3" long; this basal bract looks like a continuation of the culm. The branches and branchlets of the compound umbel are widely spreading and somewhat drooping; they are light green, flattened, and slender. Each branchlet terminates in either an individual spikelet or a dense cluster of 2-5 spikelets; the spikelets in each cluster are sessile or they have short pedicels. Each spikelet is about 6-8 mm. (1/4–1/3") in length and ovoid or ovoid-lanceoloid in shape, consisting of a compact head of perfect florets and their overlapping scales. The spikelets are brown to reddish brown and hairy in appearance because of the persistent bipartite styles (which become contorted and brown with age). The styles of the florets are white during the blooming period. The scales are ovate, brownish, and about 2.5–3.0 mm. long; each scale has a green central vein that may terminate in a very short awn. The blooming period occurs during the summer; the florets are wind-pollinated. Each fertile floret produces a single achene about 1.5–2.5 mm. long that is obovoid and brown; at the apex of each achene, there is a short slender beak. Each achene is surrounded by 4-6 bristles that are as long as or a little longer than the achene. The root system is fibrous and strongly rhizomatous. Dense colonies of vegetative plants are often formed from the rhizomes. Cultivation: Great Bulrush prefers full or partial sun, wet conditions, and soil that is mucky or sandy. This species is easy to cultivate in wetland areas (including shallow water), but it can spread aggressively. Propagation is easiest by division of the rhizomes. Range & Habitat: The native Great Bulrush is common in central and northern Illinois, while in many areas of southern Illinois it is occasional or absent (see Distribution Map). In addition to North America, this species (or very similar species) can be found in Eurasia and other continents. Habitats include wet prairies, marshes and sandy marshes, swamps, borders of lakes and ponds, swales and sloughs, interdunal depressions, and ditches along roadsides and railroads. 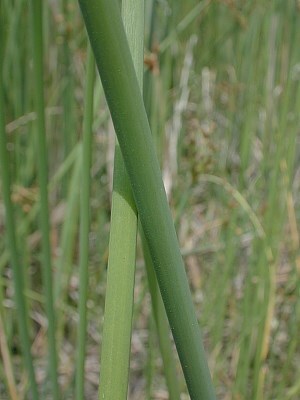 Generally, Great Bulrush is found in wetland areas where there is little wave action, which can damage its soft stems. This species thrives in wetlands with a history of disturbance, but it is also found in higher quality wetlands. Faunal Associations: The following information about insects applies to Scirpus spp. (including Schoenoplectus spp.) in general. The larvae of several leaf beetles (mostly Donacia spp. & Plateumaris spp.) feed on the submerged stems or roots of bulrushes; the Leaf Beetle Table lists these species. The caterpillars of the moths Archanara oblonga (Oblong Sedge Borer) and Archanara subflava (Yellow Sedge Borer) bore through the stems of some bulrushes, as do the larvae of the Scathophagid fly, Cordilura varipes. The seed bug Cymus luridus feeds on the seedheads. Among vertebrate animals, the seedheads of Great Bulrush and other bulrushes are an important source of food to many wetland birds, particularly ducks (see Bird Table for a listing of these species). Dense colonies of Great Bulrush also provide cover and nesting material for many birds. Muskrats feed on the foliage and rhizomes. Photographic Location: Edge of a pond at the Arboretum of the University of Illinois in Urbana, Illinois; also a roadside ditch in the same city. Comments: This is the tallest bulrush in Illinois; it is a reliable indicator of wet conditions. There are several scientific synonyms for this species, including Scirpus validus, Scirpus tabernaemontani, and Scirpus lacustris validus. Sometimes 'tabernaemontani' is spelled incorrectly as 'tabernaemontanii.' Another common name is Soft-Stem Bulrush. Great Bulrush differs from other bulrushes (Schoenoplectus spp., Scirpus spp., etc.) by its great size, lack of significant leaf blades, and soft culms. The culm-like bract of its inflorescence is short (less than 3" in length). 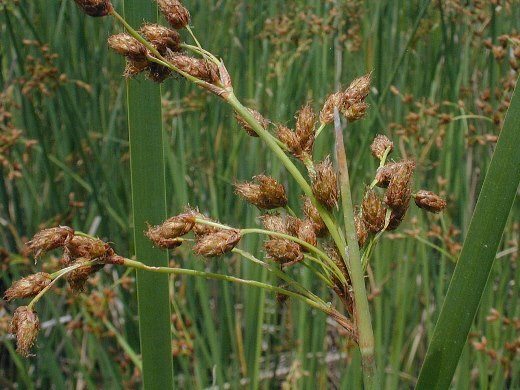 This species resembles the closely related Schoenoplectus acutus (Hard-Stem Bulrush; a.k.a. Scirpus acutus) and Schoenoplectus heterochaetus (Slender Bulrush; a.k.a. Scirpus heterochaetus). 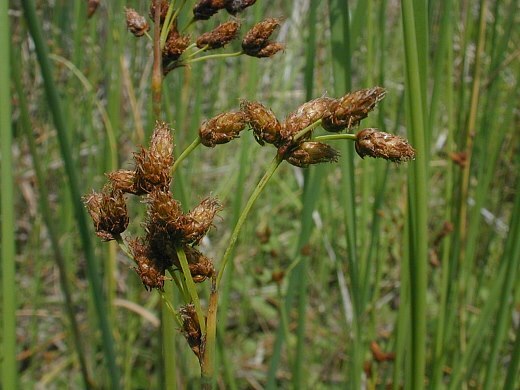 Hard-Stem Bulrush has harder culms and slightly longer floral scales (3-4 mm. ), while Slender Bulrush has 2-4 bristles per achene and the styles of its florets are tripartite. These latter two species tend to be smaller in size than Great Bulrush and they are less common.